The "Black" Entitlement Welfare Mentality. You are here: Home / Money / Business / The “Black” Entitlement Welfare Mentality. The “Black” Entitlement Welfare Mentality. (ThyBlackMan.com) Why did I say “black”? To get your attention and obviously it did because you are still reading. Does the African-American community struggle with a reparations “your owe me” mentality? Yes it does. And we have to be careful that such a mindset is not the offshoot of a “take care of me” way of thinking which came from the slaves of former slave owners. But before you start with the insults and assume that I think I am of another color, let’s do a little real talk and get some things straight. While it is true that they say this country was to be of the people, by the people and for the people – that has never been true from its foundation. At least not for people of color. So the mindset that the government of these United States should take care of its people because we are the government has always been an illusion. Maybe the concept would be true if we lived in a real democracy where the people had the power – but we don’t. We live in a democratic republic where we elect people who we empower – only for them to then be bought off by special interest groups and corporations who use lobbyists to legally bribe our senators and congressman. So enough of the illusions, real talk. We need not forget that Robin Hood was a thief. Thus the mentality that the rich should pay for the poor, pay more because they make more and be penalized because they found bigger and better ways to prosper is just plain unfair. Instead we should be pushing for a level playing field of opportunity free from institutional racism and ethnic ceilings on prosperity. There are reasons he Africans, Indians, Chinese and Hispanics come here and do well. And it is not just because they get all the bank loans that “black” people are denied. As a people, they stick together. They do not have the crabs in a basket mindset commonly seen through much of the “black” community. These other groups help each other. Even their crime rates against their own are lower than black on black crime. They have a “work hard, stick together and keep what you own” mentality. They have strong concepts of family and entrepreneurship – concepts and practices that American slavery all but destroyed in the “black” community. And yet we don’t have time to make excuses. The only way old Massah can stop you is if you believe he can – regardless of whether he wears a hood, a suit or a badge. You don’t need his food stamps to feed your family if you know who you are and you act like you know. You don’t need his project housing. You don’t need him to tell you what formulas you can feed your children. You don’t need his free cell phones. And the only way you even think you need these things is if you have no idea who you are and the greatness that lies within. You have to realize that what appears to be free stuff is not really free and it comes with a price – a cycle that causes generation after generation to expect handouts from Massah. All of us need help at some time and for a time. But such a dependency should not become a way of life. Today many of our people push for a $15 minimum wage. Ludicrous. Minimum wage is intended to be “minimum wage”, not a career wage that enables you to comfortably take care of your family. The minimum wage should not be enough because it should motivate you to climb the latter, get promotions, go back to school or even find a better job as you learn what you want to do and be. Thus the higher minimum wage is just another handout forced on society by the government that says you cannot take care of yourself and your family without it’s help. Wrong. If you want and need more money, go out and make it (legally and hopefully morally). Believe in yourself more than you believe your job and Massah in the government has the responsibility to take care of you. How many times, years and experiences will it take you to realize Massah does not care about you? How many times must you hear that you have the potential and prosperity is up to you> How many times must you be told that those who control your finances and your status in life actually control you? 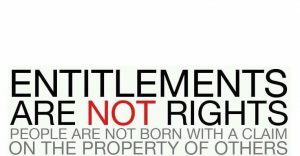 It is a joke that the federal government welfare, WIC, section 8 and even free healthcare are referred to as “entitlement plans”. Why are you entitled to “free stuff”? And it is not actually even free. Those of us who pay taxes are paying for the SNAP cards used to fill up the grocery carts. So if anybody is “entitled” to free stuff. it should be those of us who keep paying for food stamps, WIC, free healthcare for others and government programs which allow people to pay $42 a month rent for a place to live. We who pay for all of that like free stuff too. But where is ours? All I here when I ask that question is crickets. Then of course there are the churches and the charities with their hands always out. Goodwill does create jobs but not ones that pay anything decent. All the while the CEO of Goodwill makes millions and the Goodwill inventory is almost entirely free and donated. But wait, then there are the pulpit pimps, conmen and women and money-changers who fly around in jets, live in mansions and drive expensive cars – all paid for by gullible church members who are trying to do the right thing. Yet let those same church members need help and all of a sudden the church transforms into a bank and loan approval center – unless you want a can of green beans and some day old donated bread. Without getting onto religion and issues of faith and works, since there are so many varied opinions and so much disagreement, I will simply say this. From a realistic and practical standpoint, nobody owes you anything free. You are responsible for you and your family. Can others help? Yes. Should others help? Yes. But you have to lead the way in taking care of yourself and your family – not the government, not your job and not the church. So what about reparations? First of all there is no unified, coherent and thoroughly research plan of how to logistically determine who should get what and how it should be administered. There are just people and groups with their hands out shouting “you owe us money because our ancestors were slaves”. O.K but you were not a slave so why should you get the money? How much? Over what period of time? How often? And for how many ancestors when many of you do not even know who your ancestors were that far back? Have you even done the ancestry research or do you just want reparations like it I an out of court settlement? Hands out, hands out, always hands out. Give me a break. The law of the land stolen by the crooked illegal immigrant colonizers was largely slavery and it was wrong. Agreed. But you getting a bag of free money for what your ancestors went through will not solve the problem. They should have gotten it just like Israel, France and others. But it didn’t happen. And you should not reap where you have not sown. When have you been a slave – except in your mind? And for many of our people, the reparations for that cannot start because their mental slavery has not even ended. It’s time to wake up and realize how much is up to you – you not Trump, you not Obama, you not your job, you not your church. You, yes you and your family. Bind together, build together. Rise together, Achieve together. And win together! Then tell Massah where he can stick all of his cycle-creating, life-controlling handouts. And finally, many of you started off reading this article probably thinking I had no identity. Or that I was Cointel Pro all day long. But if you really sit back and think hard about the points of this article instead of simply getting offended, you will see that it makes a lot of sense. You will also hear the call for you to rise up and stop expecting to be taken care of by those who do not care about you. Time to wake up!